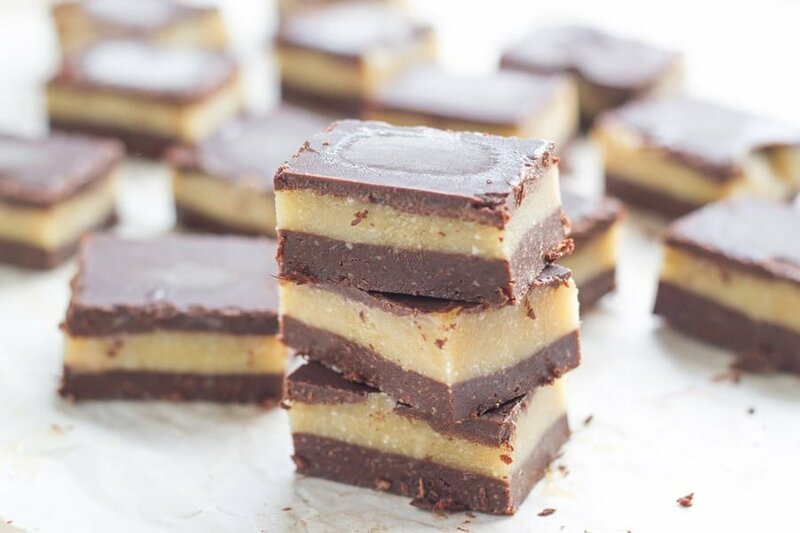 Raw peppermint slice is one of the yummiest raw slices ever! Even better when infused with peppermint essential oil. There is no denying that I have a thing for chocolate and chocolate desserts. I have loved chocolate since I was a child and it has been there for me when I have had a bad day. So, being able to create healthy dessert recipes that I can enjoy without the associated guilt makes me a happy girl. I created this raw peppermint slice back in the earlier days of Becomingness. I remember loving mint slice when I was a kid, it was one of the choc treats I used to buy from the shop near my school. I knew that I needed to make a raw version that was healthy. 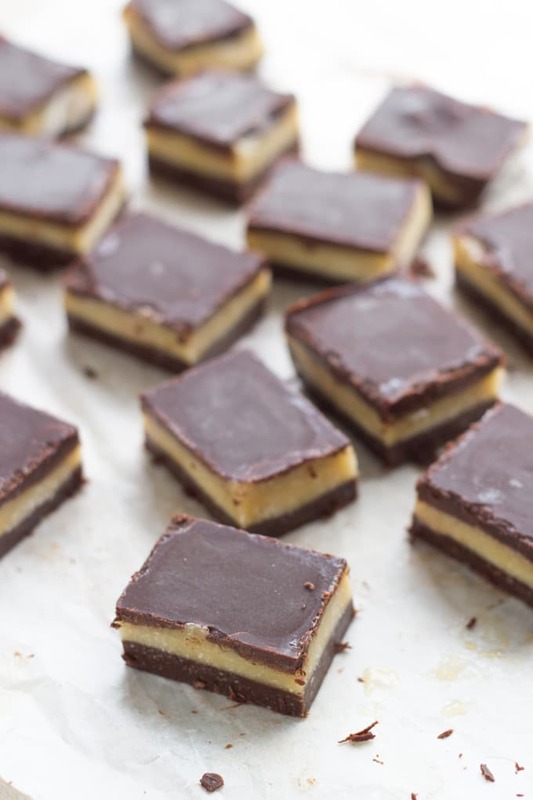 This raw peppermint slice is made up of three layers – base layer, peppermint layer and raw chocolate layer on top. The peppermint layer is infused with peppermint essential oil, which provides amazing flavour! To avoid the top chocolate layer cracking when you cut it, is to slice it with a warm dry knife. You can either run the knife under hot running water or dip it into hot water. Then make sure you dry the knife before slicing your slice up. 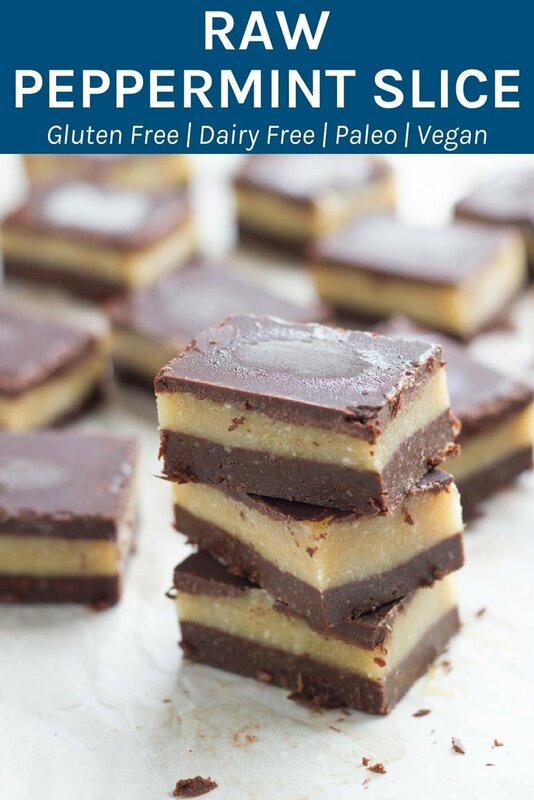 As per most of my recipes, it is gluten free, dairy free and refined sugar free and suitable for both vegan and paleo lifestyles. 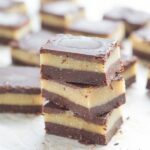 If you are after some more raw desserts to try then make sure you check out my raw caramel slice bites, raw chocolate raspberry slice and raw bounty slice. To make the base, process the macadamias in a food processor or blender until they resemble fine crumbs. Next, add the cacao powder and process until well combined. Then, add the dates and process until a sticky dough is formed. Spoon mixture into a lined square baking tin and smooth with the back of a spoon. To make the peppermint layer, process the macadamias and desiccated coconut to a high speed blender and blend until nice and smooth. Add the remaining the maple syrup and peppermint extract to the mixture and blend until creamy. Add to the base and smooth over with a spatula or back of a spoon and place into the freezer for at least 20 minutes. To make the chocolate layer: melt the coconut oil in saucepan on low heat. Once melted, add the maple syrup, whisking briskly until well combined. Then add the cacao powder, stirring until well mixed through. Pour the chocolate on top of the peppermint layer. Put back into the freezer and let it set completely (around 2-3 hour). Cook time does not include the time it takes for this slice to freeze — approximately 2-3 hours, depending on the temperature of your freezer.